At the udon restaurant "Shin" located in Shinjuku, customers can enjoy fresh noodles, cut and boiled just after the order is made, and made into exquisite dishes. Shinjuku is one of the main amusement areas in Tokyo. Many visitors like this area because of its easy accessibility, and for gourmet fans, there are a wide variety of restaurants located near the station itself. Udon Shin (うどん慎, "Shin" for short) is a restaurant specializing in udon (thick white Japanese noodles) and is located in an alleyway near Shinjuku station. This article introduces the fine udon noodles that Shin offers. Shin thrives on offering udon at its finest: they don't make a batch in advance, so the udon that you order is cut and boiled fresh for every customer. The boiling time of the noodles is even adjusted from day to day in order to take things like temperature and humidity into consideration. In order to offer the best udon, the condition of the noodles comes first, even before efficiency. The high quality of the dishes served in this restaurant are proof of the chef's commitment to this ideal. At Shin, there are two kinds of udon, the cold zaru udon - served in a bamboo wire basket, and the warm kake udon- served in a hot broth along with various toppings. Here are some of their most popular dishes. The tenzaru, priced at 1300 yen, is a set of cold zaru udon, immediately cooled after boiling, and an assortment of shrimp and vegetable tempura. The customers can enjoy looking at the udon layed out in a coiled fashion, which is a unique arrangement. The zaru udon comes with a cold, katsuobushi-based dipping sauce. The sauce has a deep flavor and a pleasant freshness. It goes perfectly with udon, especially in summer. The tempura assortment consists of two shrimp and vegetables. They are all crisp, with a light taste and the shrimp have a tender texture. This is kake udon, beef and gobō (burdock root) tempura, priced at 1250 yen. The appetizing soup is made from a dried bonito-based broth. 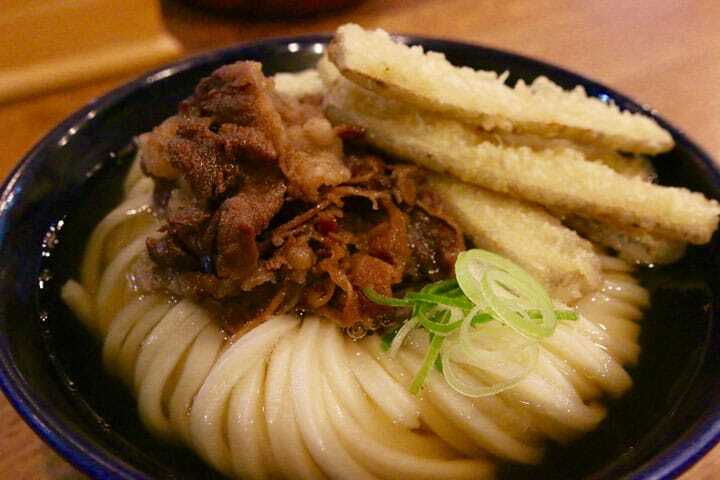 The warm udon noodles come with sweet-flavored stewed beef, which blends nicely with the soup. The crunchy gobō tempura adds to the variety of taste and texture. The zaru udon and the kake udon are different from each other in that the dipping sauce for the zaru has a richer flavor and udon is springy, while the kake soup has a lighter taste, and the udon is smoother. Customers can add other tempura types or different toppings too, creating a dish of their own. From the station it is about a five minute walk to the restaurant, which is located in a hidden alleyway. The storefront design is a blend of both Japanese and Western styles. Go through the noren curtains at the entrance, and you will see that the interior consists of six counter seats and two tables. The compact space inside is filled with customers during the busy hours. There are simple English descriptions of each dish in the stylish menu, so visitors from abroad need not worry. If you want to try a delicious and fresh udon noodle dish, "Udon Shin" in Shinjuku is the place to go. Station: JR Shinjuku Station (新宿駅), Minami-Shinjuku Station (南新宿駅) on the Odakyū Odawara Line. Access: 7 minute walk from the South Exit of the JR Shinjuku Station; 6 minute walk from the Minami-Shinjuku Station. *Search for “Teriyaki” on the iTunes Store or Google Play. A Guide To Shinjuku's Train Stations: Never Get Lost Again! Savor Sushi In Shinjuku - 5 Restaurants For Every Occasion!